Mass. 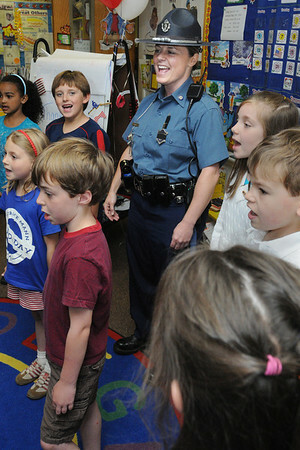 state trooper Katy Downey, center, sings "Proud To Be An American" with Elisa LaSota's first grade class at the Horace Mann Laboratory School. Every year the class corresponds with a chosen hero and then meet its hero at the end of the year on the last day of school. Photo by Ken Yuszkus/Salem News, Thursday, June 23, 2011.